Furthermore, as another sign of strength, San Diego, a city in which homeowners have lost a lot of equity since 2007, has now shown 12 straight months of home price improvement. All day, every day, conforming and FHA mortgage rates in California are in flux. Rates move in response to hundreds of factors which exact varying levels of influence. Among the biggest influences on mortgage rates is inflation. When inflation is unexpectedly high, mortgage rates tend to rise quickly. Conversely, when inflation is unexpectedly low, rates tend to fall quickly. By definition, inflation is when a currency loses its value; when what used to cost $1.00 now costs $1.10. 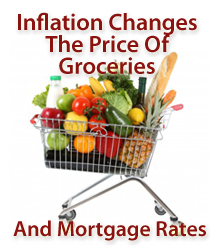 As consumers, we recognize inflation by the items we buy on a daily basis becoming more expensive. However, it’s not that goods are more expensive — it’s that the dollars we’re using to buy them have become worth less. With respect to mortgage rates, this is a big deal because mortgage rates are directly related to the price of a special type of bond called a mortgage-backed bond. On Wall Street, mortgage-backed bonds are priced, bought, and sold in U.S. dollars so as inflation renders those dollars less valuable, so it does to mortgage-backed bonds as well. It’s a chain reaction by which mortgage bonds lose value, leading investors sell them, causing bond prices to fall on the excess supply. And, because mortgage rates move opposite of bond prices, as inflation takes hold, mortgage rates rise. Lately, inflation has been exceptionally low. The Federal Reserve acknowledged as much in its last statement to the markets, and available data backs that position. This, after predictions that inflation would be “runaway” in 2010. The Cost of Living is up just modestly this year and it’s helping mortgage rates stay low. And, so long as it lasts, the cost of owning a home in South Orange County will remain relatively inexpensive. A way to cut out ALL the middle men in short sales? This article just landed in my email box, describing an interesting concept, that makes sense to me. My neighbors are being foreclosed on. He is an civil engineer, and she is a retired banker. They are the most wonderful people I have ever met, and have been such sweet giving neighbors. She basically designed and built the house from scratch. The house and land (1.3 acres) was valued at $1.8m a few years ago. Now, they are behind on payments and the bank wants to force a short sale for only $700k. She told me that she tried to modify the mortgage twice already, and has been turned down. She is willing and able to make payments on the $700k amount, but the bank is refusing and would rather sell to someone else. The message paints an interesting picture of a potentially hidden angle to the recent short sale push by the Administration, banks, and Realtors: a renewed call for broad principal forgiveness. It’s not too hard to see this sort of thinking quickly becoming the norm among many distressed homeowners, as a push for short sales grows ever stronger and many ask themselves why someone else is getting the better deal. More than 11 million borrowers currently owe more on their mortgage than it is worth, according to CoreLogic (CLGX: 18.09 +0.17%)—and this group of borrowers would love nothing more than to replace their current underwater mortgage with whatever the accepted “short sale price” is deemed to be. I don’t know that such a response on the part of borrowers could be deemed irrational, either. Many will ask themselves why they have a mortgage at a higher amount, especially if the bank is willing to sell the house to another buyer for less money. Why does someone else get the lower purchase price? Isn’t easier for the bank to just give me that loan instead? I already live here. It’s clearly a slippery slope, and not even a steep one, from a short sale push towards an outright push for the write down of mortgage principal to “short sale levels.” I suspect, in fact, that this is part of the reason some large commercial banks—Bank of America (BAC: 15.24 -1.17%) among them as of late—are working feverishly to get in front of this end game, announcing principal reduction programs that are great press exposure, and yet also protect their financial interests as much as possible. Because the truth is that the bank and/or investor may not always have the luxury of defining their terms on principal write downs, especially not with elections looming this coming November. It’s only late June, after all. Of course, reality is much more complicated. Generally speaking, the mortgage world can best be divided up into three sub-worlds: the GSEs, private-label securities, and whole loans. Depending on what class of mortgage asset you tend to hold, your viewpoints can differ dramatically; and if you hold all three, as most commercial banks tend to do, you’re facing more than a mild case of financial schizophrenia. While the truth is many investors are in favor of principal write-downs, at least to a point—and many investors buying distressed whole loans are already forgiving significant amounts of principal, because they can—many commercial banks are hamstrung by such a maneuver. What’s more, plenty of consumers (rightfully) roil at the notion that financial rewards would ever accrue to the worst performers. For most major commercial banks, for example, their whole loan portfolios present a distinct set of challenges apart from any securitized servicing they do—especially in the case of second liens (which I’ve written about before). Wide-scale principal reduction for these banks means recognizing massive losses on their second lien portfolios, losses that would blow a hole in their balance sheets so large that even the coziest of regulators wouldn’t be able to ignore it. I’m pretty sure that right now, there isn’t the political will to fund another banking sector bailout. But the will to reduce principal is already embedded in our government’s short sale push—from there, it’s only a hop, skip and a jump into the broader use of principal reductions. Editor’s note: The author held no relevant investment positions at the time this story was published. Comments Off on A way to cut out ALL the middle men in short sales? Here is an interesting article I came across today. CHICAGO (MarketWatch) — Loan modifications through the government’s Home Affordable Modification Program tripled in the first quarter compared to the fourth quarter, according to data that covers loans held by Fannie Mae and Freddie Mac, the Federal Housing Finance Agency said Tuesday. Also, loans 60 or more days past due fell for the first time in two years, dropping by nearly 23,800 to about 1.7 million in the first quarter, according to the FHFA’s latest quarterly Foreclosure Prevention & Refinance report. Overall, the FHFA said various efforts to keep homeowners out of foreclosure, including loan modifications, short sales and deeds-in-lieu, rose 75% in the first quarter compared with the previous quarter, to a total of 239,000 completed “foreclosure prevention activity” efforts. Permanent mortgage modifications through the government’s Home Affordable Modification Program rose to 136,000 at the end of the first quarter, up from 43,000 in the fourth quarter. Homeowners must successfully complete a trial modification period in order to make their modification permanent. About 66% of modifications completed in the fourth quarter reduced borrowers’ monthly payments by more than 20%. Meanwhile, cumulative refinance volume through the Home Affordable Refinance Program rose 53% to nearly 291,600 at the end of the first quarter, up from 190,180 in the fourth quarter. The program allows existing Freddie and Fannie borrowers who are current on their mortgage payments to refinance and reduce their monthly mortgage payments at loan-to-value ratios up to 125%. The Federal Housing Finance Agency regulates Fannie Mae, Freddie Mac and the 12 federal home loan banks; the numbers in the report don’t reflect the Federal Housing Administration’s efforts to prevent foreclosures. Overall, the total number of homeowners receiving restructured mortgages since April 2009 increased to 2.8 million; also, half of homeowners unable to enter a permanent HAMP modification get an alternate modification with their servicer, according to a separate report Monday from the Department of Housing and Urban Development and the Treasury Department. The 2.8 million figure “includes more than 1.2 million homeowners who have started HAMP trial modifications and nearly 400,000 who have benefitted from FHA loss- mitigation activities,” the report said. “Of those in the HAMP program, 346,000 have entered a permanent modification, saving a median of more than $500 per month,” See HUD and Treasury’s monthly housing scorecard. Separately, the percentage of loans in foreclosure or with at least one payment past due was a non-seasonally-adjusted 14% in the first quarter, down from 15% in the fourth quarter of 2009, according to a Mortgage Bankers Association report in May. That works out to about 6.2 million loans somewhere in the delinquency or foreclosure process. See story on 14% of mortgages delinquent or in foreclosure. Mortgage markets improved last week in response to mostly negative data about the U.S. economy, and the Federal Reserve’s acknowledgement that Eurozone financial ills could cross the Atlantic. Conforming and FHA mortgage rates fell last week, extending a rate rally that dates to early-April. Mortgage rates have fallen to several, new, all-time lows during this period and last week was no different. Talk to your loan officer ASAP about locking in your rate. One month after the federal homebuyer tax credit’s official expiration, the New Home Sales report turned in its worst showing ever. In May 2010, for the first time in 11 months, the inventory of unsold new homes crossed the 8-month marker, posting an 8.5 month supply overall. Additionally, new homes sales volume fell to 300,000 units nationwide — a drop of 32% and its lowest level since the Commerce Department started tracking data in 1963. Now, universally, the press is referring to the May New Home Sales report as “poor“. A closer look, however, shows that may not be the case. For one, we have to keep New Home Sales in perspective as a percentage of overall home sales. Yes, there were just 300,000 new homes sold in May, but there were also 5.66 million “existing” homes sold. New Home Sales, therefore, accounted for just 5 percent of the total housing market — a very small percentage. Another reason why the weak New Home Sales data isn’t so awful is that, when New Home Sales stall, it actually benefits home buyers. Excess supply puts a strain on sellers which, in turn, gives buyers a tremendous amount of leverage in negotiation. When home inventories are high, builders are more apt to appease their customers in hopes of making a sale. For Coto de Caza home buyers, this can result in buying a better product at a lower price. Especially with builder confidence plummeting. Since February 2009, housing has shown steady gains. There’s been both peaks and valleys across units, inventories, and prices, but overall, the market is improving. 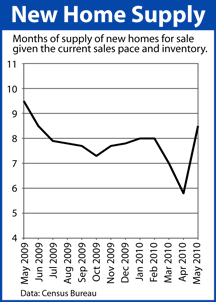 May’s New Home Sales data shows how now may an opportune time to “buy new”. Today, in its first meeting in 5 weeks, the Federal Open Market Committee voted 9-to-1 to leave the Fed Funds Rate unchanged. 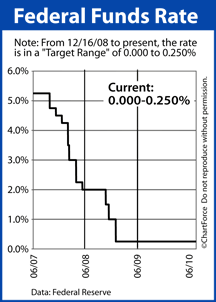 The Fed Fund Rate remains within its target range of 0.000-0.250 percent. In its press release, the FOMC said that, since April, “the economic recovery is proceeding” and that the jobs market “is improving gradually”. Business spending “has risen significantly”, too, with the exception of commercial real estate. Today’s statement is the 8th straight press release in which the Fed shows optimism for the U.S. economy, dating back to June 2009. Since that time, the Fed has terminated all of the programs it created to support the economy through the economic crisis. 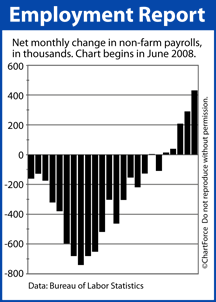 The recession is widely believed to be over. And, although the Fed’s statement acknowledged economic growth, it did highlight lingering threats, too. European debt concerns could spill-over to the U.S.
Also, as expected, the Fed re-affirmed its plan to hold the Fed Funds Rate near zero percent “for an extended period”, citing that “inflation has trended lower” recently. Mortgage market reaction has been positive thus far. Mortgage rates in California are slightly improved post-FOMC. 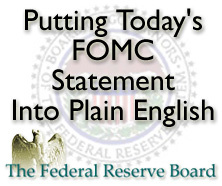 The FOMC’s next scheduled meeting is August 10, 2010. Existing Home Sales dropped in May for the first time in 3 months but still managed to post its second-highest since November 2009, buoyed by the expiring federal tax credit program. An “existing home” is a home that cannot be considered new construction; a resale of an existing home. Existing Home Sales fell 2.2 percent in May. The press is calling the drop in sales “unexpected” and disappointing, but a deeper look at the data shows the news isn’t as bad as it first appears. 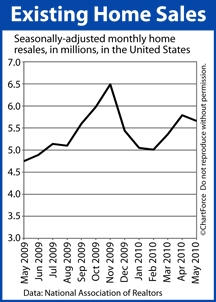 First, on a regional basis, sales were mostly solid. Only the Northeast region posted a loss. The West even managed a gain. Second, the supply of homes for sale dropped to 8.3 in May and, because home prices are based on supply and demand, this is a positive for pricing. By comparison, in 2008, the average existing home inventory was 10.4 months. And, lastly, in May, first-time home buyers represented 46 percent of all buyers. The number was likely buoyed by the tax credit program but that doesn’t damper the fact that first-time buyers provide a support floor for the housing market. First-time buyers in Coto de Caza enable “existing owners” to move-up to bigger homes, which, in turn, trickles up to the mid-size and jumbo markets. Analysts expected more from May’s numbers and that may explain why the reaction to the data is generally negative. 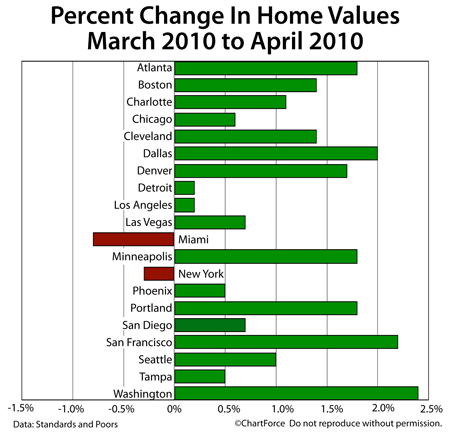 However, in many cities, home resales did just fine. There’s no expectation for the Fed to change the Fed Funds Rate after it adjourns tomorrow, but that doesn’t mean consumers in Trabuco Canyon should expect mortgage rates to remain unchanged, too. Mortgage markets improved last week on weaker-than-expected jobless figures, ongoing troubles in Europe, and a tame reading on domestic inflation. As a result, conforming mortgage rates for California fell last week, drawing loads of new refinance applications. For a brief moment Thursday afternoon, mortgage bond prices pierced a key support level, dropping rates in Coto de Caza to their best levels of the year. If you’re shopping for a mortgage, rates remain very low but could reverse quickly. 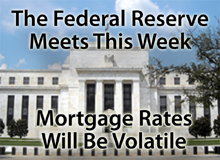 Your biggest risk is tied to the Fed’s adjournment Wednesday afternoon.